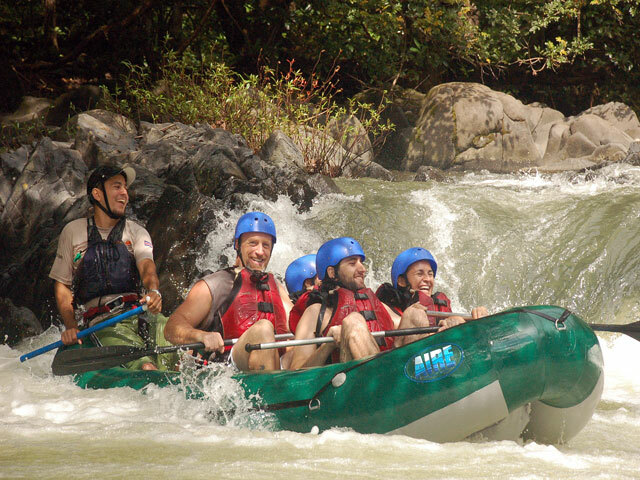 Travel from Monteverde to the Beach and Whitewater Raft Along the Way! This is the best way to travel to the beach!! Go rafting on the way from La Fortuna or from Monteverde on the amazing RIO TENORIO Class 3-4. From Arenal you would take a scenic drive along the beautiful, but windy road of Lake Arenal – get great views of the Arenal Volcano. From Monteverde the views of the surrounding hills and farmland are beautiful. You will get to the isolated rustic Guanacaste backroads and then take a rugged, 4x4 ride to the the river put-in at the bridge over the Río Tenorio. As part of our People+Planet=Prosperity project, we have created a public river entrance for use of the local public with government approval. 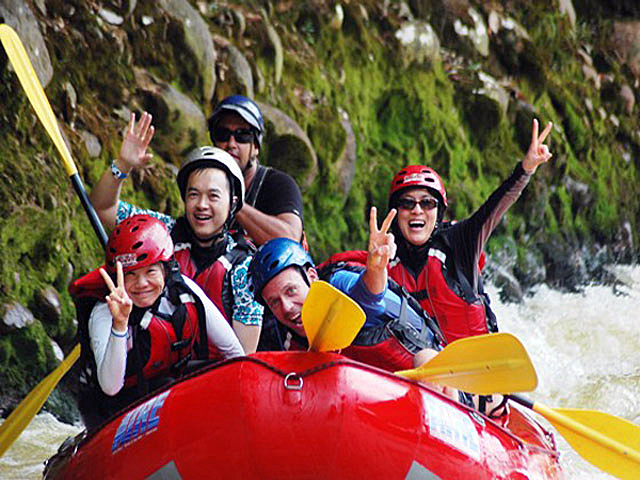 You’ll receive a thorough safety briefing and get fitted for your equipment -- helmets, life jackets and paddles. 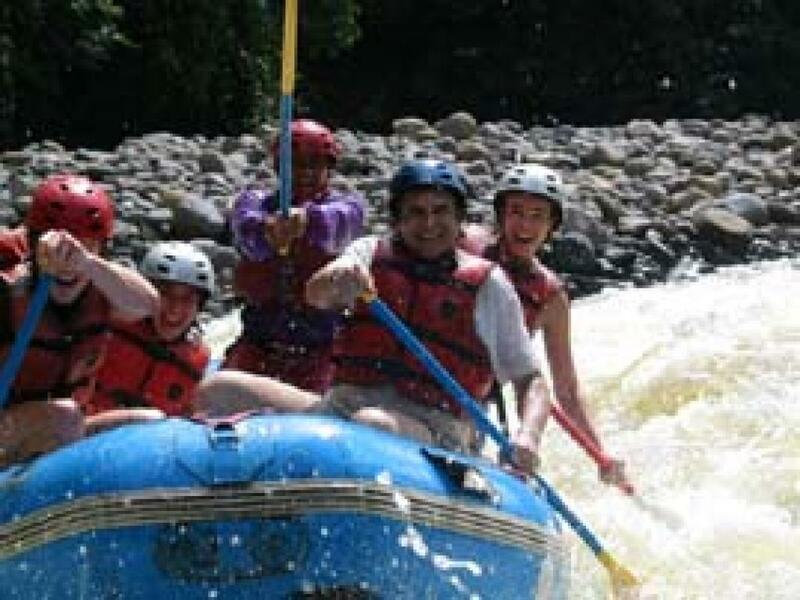 Practice with your guide and then enjoy a beautiful 2.5-hour rafting trip along the arrid and impressive canyon of the Tenorio River in Costa Rica’s picturesque Guanacaste province. Get over 20 fun, exciting rapids, a fresh fruit snack, hike to a local waterfall, and plenty of wildlife along the way like iguanas, tropical birds and monkeys. This unique rafting tour finishes with a thrilling, 10-foot waterfall drop!! When you arrive to the private Desafío river exit, do a quick hike to the 4x4 vehicle to drive out of this isolated, unspoiled region of Costa Rica. Have a delicious lunch, use our changing rooms and then head on your way to your hotel in the Guanacaste beach area for a glorious Pacific sunset. Prices not available online yet. Please contact us for tours today or tomorrow before booking.